Lisa Sorg of Uruknet writes: The argument for impeaching Bush isn’t based on disagreements over philosophy or policy, but on the Constitution. As detailed in a 3,900-word article in January 30 issue of The Nation, impeachable offenses include presidential abuses of power that endanger the constitutional system. Elizabeth Holtzman of The Nation: Finally, it has started. People have begun to speak of impeaching President George W. Bush ... As a former member of Congress who sat on the House Judiciary Committee during the impeachment proceedings against President Richard Nixon, I believe they are right to do so. Ronnie Dugger of the Texas Observer: The year 2006 will be historic for the nation, and probably for humanity. Texans Bush and Rove and their conspirators in the second Bush presidency have disgraced American democracy at home and in the world with debasements of our nation and our values that have now entered their climactic phase. Jim Puzzanghera of Knight Ridder Washington Bureau: The word "impeachment" is popping up increasingly these days and not just off the lips of liberal activists spouting predictable bumper-sticker slogans. 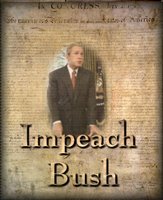 After the unfounded claims about [WMD's] and recent news of domestic spying without warrants, mainstream politicians and ordinary voters are talking openly about the possibility that President Bush could be impeached. Detroit Free Press: A Democratic congressman, a prominent legal scholar and a self-described target of government surveillance urged Democrats on the House Judiciary Committee on Friday to consider impeaching President George W. Bush for his domestic surveillance program. This would give him absolute dictatorial power over the government with no checks and balances. 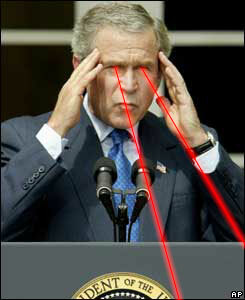 Bush discussed imposing martial law on American streets in the aftermath of the 9/11 terrorist attacks by activating “national security initiatives” put in place by Ronald Reagan during the 1980s. 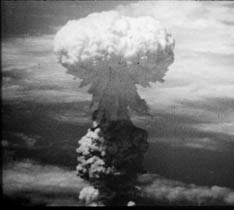 From CBS: North Korean three-star General Ri Chan Bok tells correspondent Dan Rather that if the U.S. invades his country, he will use nuclear weapons to defend it. “Tell the American people that you met the general. 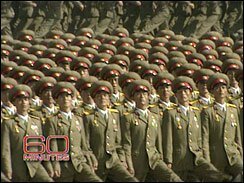 If the United States invades our country and starts a war, the People’s Army will fight to the death and defend ourselves, taking appropriate revenge,” says Gen. Bok. Tom Engelhardt writes: 2006 is sure to be the year of living dangerously -- for the Bush administration and for the rest of us. In the wake of revelations of warrantless spying by the NSA, we have already embarked on what looks distinctly like a constitutional crisis... In the meantime, the President, Vice President, Secretaries of Defense and State, various lesser officials, crony appointees, acolytes, legal advisors, leftover neocons, spy-masters, strategists, spin doctors, ideologues, lobbyists, Republican Party officials, and congressional backers are intent on packing the Supreme Court with supporters of an "obscure philosophy" of unfettered Presidential power called "the unitary executive theory" and then foisting a virtual cult of the imperial presidency on the country. Steve Watson of Infowars writes: The implementation of such technology represents a giant leap into a total surveillance Big Brother society. People are faced with walking into booths raising their hands above their heads like they're a criminal and being electronically scanned... The general public will accept any level of intrusiveness so long as it gives the IMPRESSION that they are safer, in reality it doesn't make anyone safer it just eliminates your liberty. NY Daily News: Sheryl Crow can't get George Bush off her mind. Like his father, the President has sought to turn America into "an imperial power and create strongholds over oil-heavy countries in order for us to control and manipulate them," she told us. 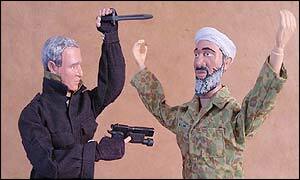 "Now, if we pull out [of Iraq] we are going to leave a complete and total mess. We don't even know who we're fighting over there." 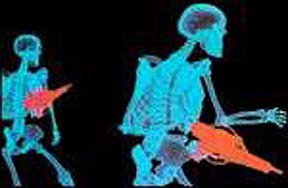 Michel Chossudovsky of Global Research writes: The launching of an outright war using nuclear warheads against Iran is now in the final planning stages.Coalition partners, which include the US, Israel and Turkey are in "an advanced stage of readiness". 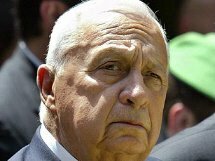 In turn, Prime Minister Ariel Sharon has given the green light to the Israeli Armed Forces to launch the attacks by the end of March. Saree Makdisi for the Los Angeles Times writes: From the beginning to the end of his career, Sharon was a man of ruthless and often gratuitous violence. The waypoints of his career are all drenched in blood, from the massacre he directed at the village of Qibya in 1953, in which his men destroyed whole houses with their occupants — men, women and children — still inside, to the ruinous invasion of Lebanon in 1982, in which his army laid siege to Beirut, cut off water, electricity and food supplies and subjected the city's hapless residents to weeks of indiscriminate bombardment by land, sea and air. 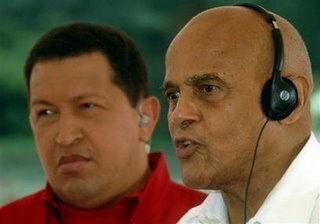 Ian James of AP writes: The American singer and activist Harry Belafonte called President Bush "the greatest terrorist in the world" on Sunday and said millions of Americans support the socialist revolution of Venezuelan leader Hugo Chavez. 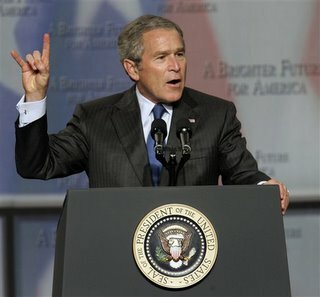 Propaganda Matrix writes: Ask yourself, why is Bush flashing a Texas football sign at an Economic Club gathering in Chicago? Aversion says: Morrissey has no love for Los Angeles' police force. 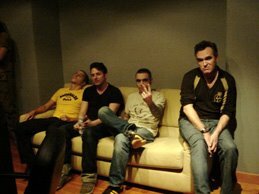 In an online interview conducted by True-to-You, Morrissey... revealed that, although he’s made Los Angeles his surrogate home in the States, he’s a little uneasy around the town’s police force. “As stunningly beautiful as Los Angeles is, it is also essentially a police state,” he said. "You must glorify war in order to get the public to accept the fact that you're going to send their sons and daughters to die." 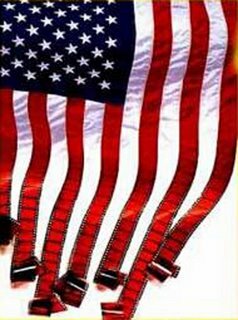 so as we approach oscar season, you should know that the pentagon uses hollywood for propaganda . Brian Courtis of The Age writes: "We hear less...about the effects of the powerful relationship that has grown over the years between the Pentagon and the Hollywood studios, a partnership that not only can save millions of dollars for filmmakers and produce fine recruiting propaganda for Washington, but can twist history and reality to produce the ultimate in international spin." c.i.a. enlists h'wood & h'wood gives war games "razzmatazz"